"This glistening track tops off a stellar debut year for Breen. His voice has a sensitivity that you believe in and a passion you wish you had." 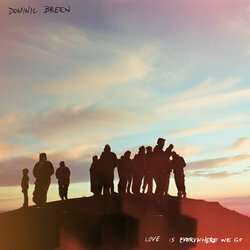 ’Love is Everywhere We Go’ came to Breen in a dream in which he was a roadie watching side of stage while a band played the song in a small theatre. Upon waking, he realised that the song wasn’t theirs - it didn’t actually exist yet and was his to write. It rounds out an exciting year for Dominic Breen, in which he inked an international booking deal with WME and played a tonne of shows, including a tour with Vancouver Sleep Clinic. Breen’s song ‘Sydney Kids’ was chosen by Ben Folds as one of his favourite songs on Triple J Unearthed, while his video for ‘Lay Low’ turned heads with an incredible performance from acting legend Richard Roxburgh. Roxburgh agreed to do it (his first music video ever) after being moved by the song and concept.